If you are thinking about having your child christened, congratulations on their birth, whether it was very recent or a little while ago now. For most of us, the arrival of a child is a very special time in our lives, and we want to celebrate it with our family and friends. Here in this benefice, we would love to help you mark this special occasion and help your child take his or her first steps on an amazing journey of life and faith. At a christening your child will be baptized with water. This is the heart of your child's christening. The vicar will pray for your child and for all those who will support them on their journey of life and fath. You and your godparents will make some important promises for your child. Everyone present will promise to continue supporting your child from this moment on. A special oil will be used to make the sign of the cross on your child's forehead. It's a significant moment, as it shows that God loves your child and will be with them on their journey of life. If you wish, you and your godparents can also join in and make this sign on your child's forehead. 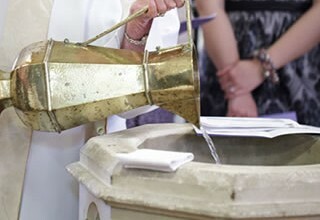 Water, which is blessed in the church's font, will be poured over your child's head by the vicar. This is your child's baptism. Everyone present will welcome your child into God's family, the church. A Children's Bible will be given so that your child can enjoy listening to stories about God's love for us and find out about his Son, Jesus. Baptism marks the start of a lifetime of discovering more about love, faith and hope, and is a wonderful moment to celebrate and remember each year on your child's "Baptism Birthday". Here in this benefice, we are happy as a church family to support you, your godparents, family and friends on this amazing journey. Baptisms can take place in a main Sunday service in any one of our four churches, or in a separate Christening service on a Sunday afternoon to suit you and us. If you have any questions or would like to arrange a christening service for your child at one of our four churches (Hardwick, Mears Ashby, Overstone or Sywell), please complete the application form below. Our vicar - Revd Katrina - will contact you to make the arrangements. If you are interested in being baptised as an adult, please contact Revd Katrina. For more information on christening services in the Church of England, and for more ideas on how to nurture your child's journey of life and faith, please follow this LINK. If you want to check which is your parish church, please follow this LINK. If you live outside our benefice and one of our churches has a special meaning to you or your family, we can christen your child. We just need to ask your vicar's permission first.